Do you want your staff to be able to…. What this means for you and the company…. How do you achieve this? Easy…..
• Positive Communication and Management of time. • Building strong and effective teams. Mindfulness meditation is a focus on the current moment without the stress and anxiety of judging. Workers that take a little time each day to rest in the inner quiet of meditation will protect their mind-body balance, it will help them stay centred and calm, and open them to their highest potential for creativity and success. 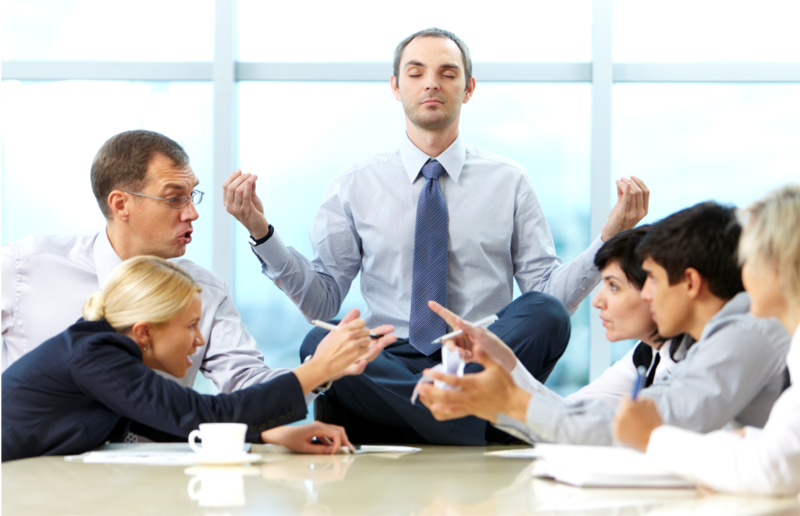 Processes such as Decision Making, Empathy, Concentration and Stress Reduction all benefit from Mindfulness Meditation. Stress Management – Participants are educated about the cause and effect of stress (fight or flight reaction) and provided with worksheets to help them develop an understanding of what causes stress for them in their work environment. Relaxation Skills – Brainstorming session for identification of the most common stressors and to overcome or eliminating the stresses. Sharing of ideas in an informal, sae and non-judgemental environment is an excellent team building opportunity. The Science of Positive Psychology –Developing positive thinking skills, Positive Self Talk. Identifying and improving negative attitudes and being able to illustrate the individual’s ability to choose between positive and negative attitudes. Building Strong and Effective Teams – Participants working together in small groups or if not enough on larger groups to develop an understanding of what is involved in creating a strong team environment. Demonstrating an understanding of how we can contribute to a better team environment in the workplace on a day to day basis. Goal Setting and Achieving – Goal setting for most people is easy, achieving the goals is the difficult park. Here we will learn formulas for achieving the goals we set ourselves. The Natura Workplace Stress Management program offers businesses six components that blend to create a very effective tool box for both management and staff to apply both in the workplace and in their personal lives. The program is intended to be run as six, one hour sessions over six weeks. Depending on circumstance it can be adjusted to run as a six hour one day, or three hour two day workshop.